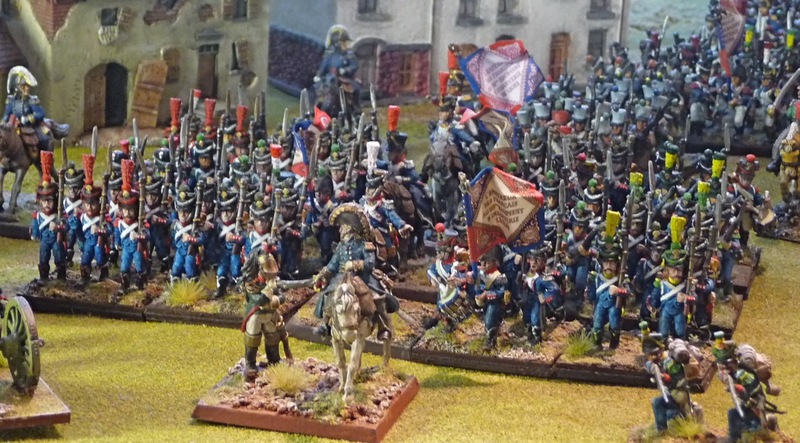 I finally have finished the reorganization of my French army. 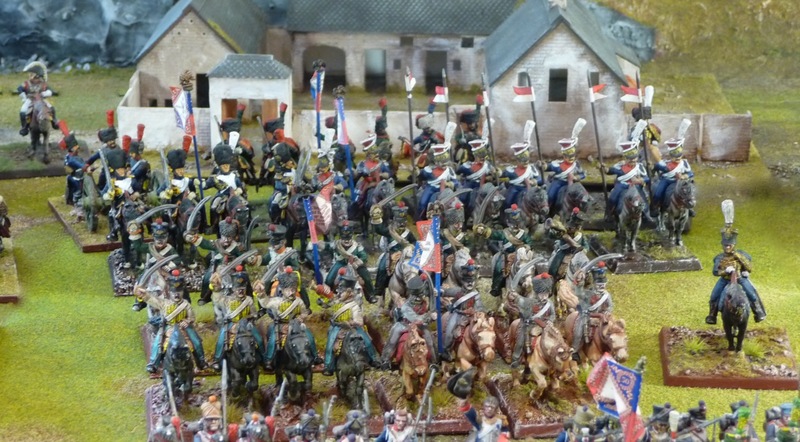 I just could not resist the lure of the big battalions any longer. As previously discussed, I had decided to go with 6 figure bases, it did take a bit of work and some thought but I am quite happy with the result. Reorganizing also makes one consider the direction to take in further figure acquisition and painting projects. After a lot of thought, I have decided to abandon strict adherence to Orders of Battle to build forces, and go with something that is more wargaming friendly. 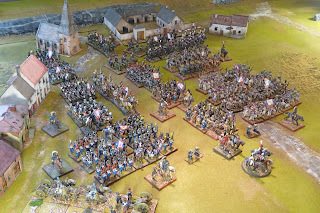 I have found Lasalle's Army Builder, the best thought out and the most user friendly resource available. I have compared multiple OB's for many armies and find that it is quite easy to graft an historical OB's on to the Army Builder and come up with quite a coherent and historical result. I was actually surprised how much of the French Army List, I had completed for Peninsular theatre. As you can see from the following, I easily crossed off multiple options; including the Core Attack Division as well as 3 of the 4 Organic Infantry Brigades and am on the way for a brigade from Reserve Infantry Division. 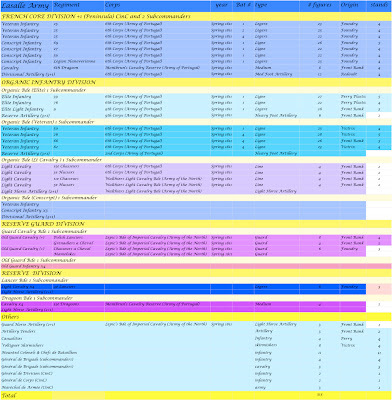 If the final column is the same colour as the list, than it is completed. 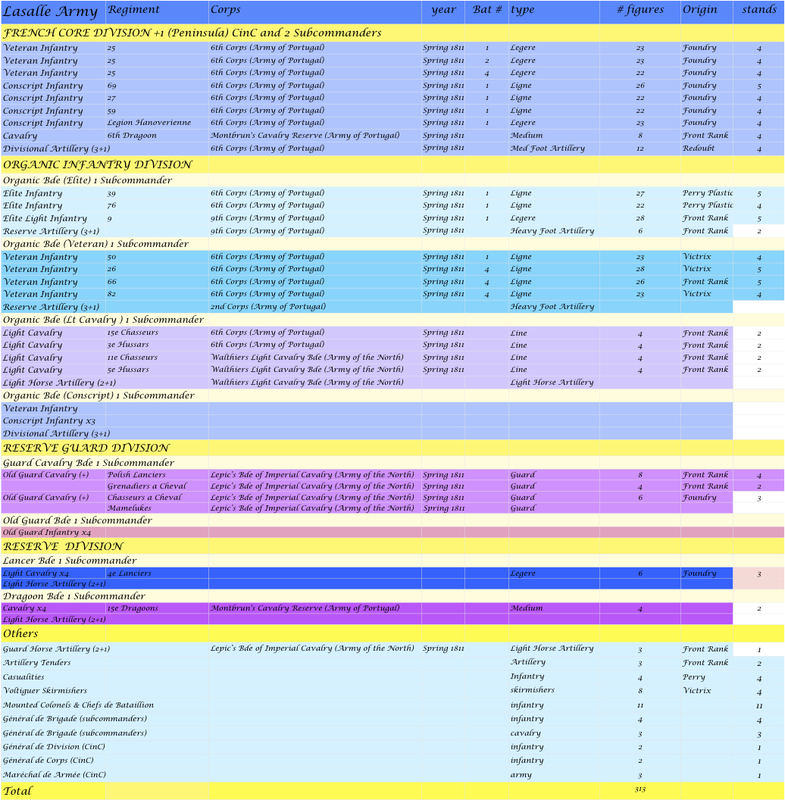 You should note that I am planning to use some 5 base infantry units in Lasalle games, only a minor modification of the rules is required. 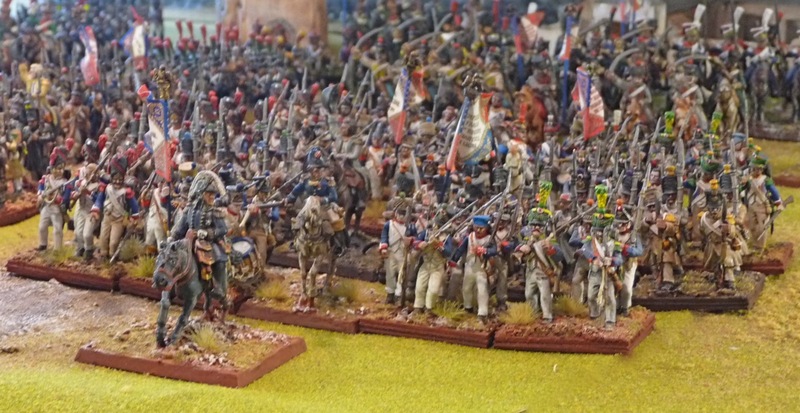 Part of the Reserve Guard Division for the Empire and Hundred Days theatre is done as well. 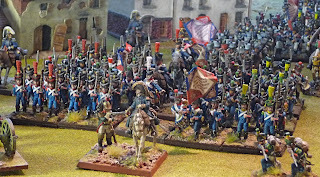 I plan to work on building up my cavalry and artillery units first, but I do have a box of Victrix Old Guard Infantry burning a hole on the shelf so I may be tempted. 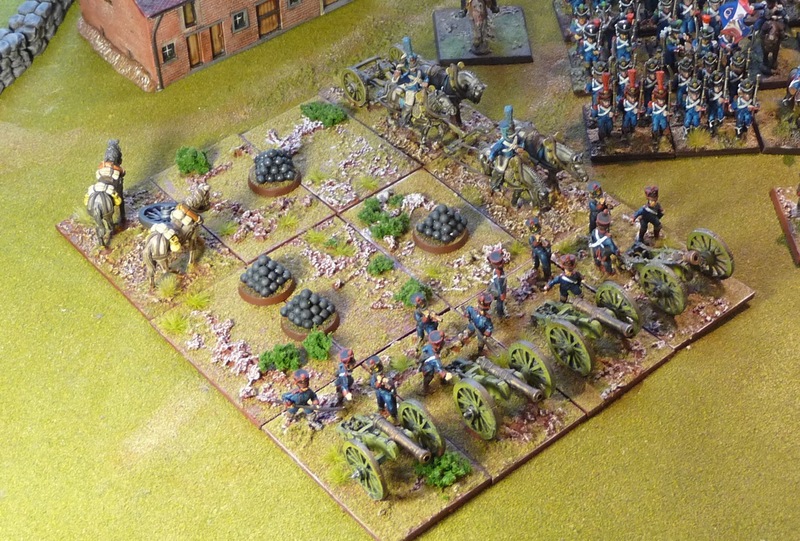 Anyway here are a few snaps; no new units I am afraid, but the big units do look nice. And should, of course mention, that these units are based for both Field of Battle and Republic to Empire wargaming rulesets. Core Infantry Division: Foundry figures painted 3 years ago. 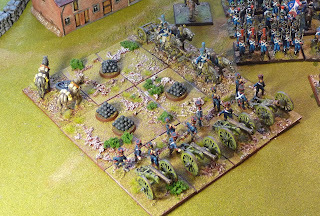 Core Divisional Artillery Battery unlimbered ready for action. 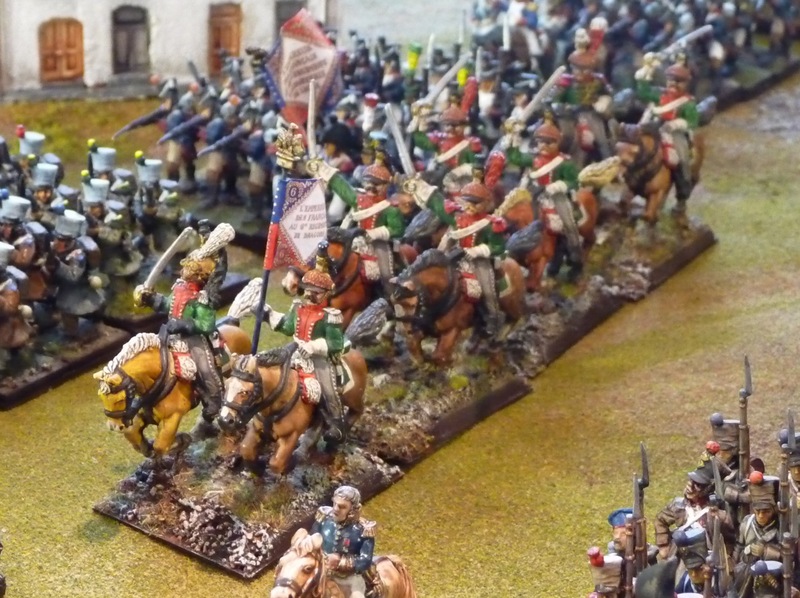 The 6e Dragoons, cavalry support for the Core Infantry Division. 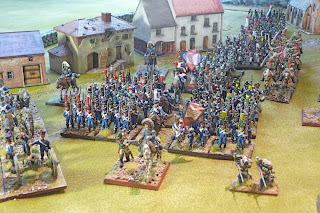 Three battalions of the veteran 25e légére: Foundry figures. The Veteran Organic Brigade: Mostly Victrix with 1 Front Rank unit, painted in the last year. 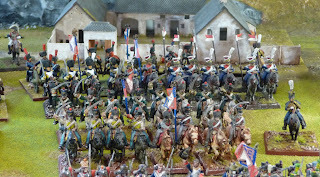 The Elite Organic Brigade, Perry and Front Rank figures painted about 2 years ago. 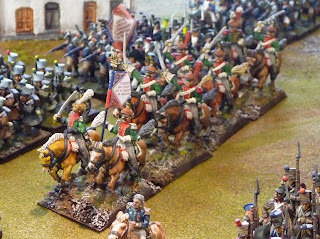 The beginnings of the Light Cavalry Organic Brigade in the foreground and the almost completed Reserve Guard Cavalry in the background. 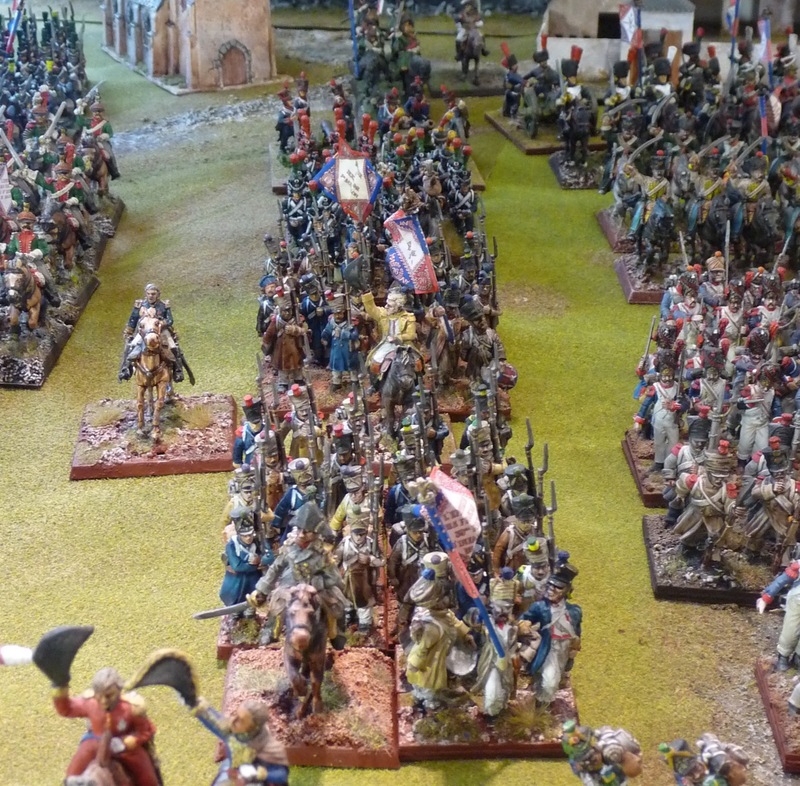 Well time to get on to the Anglo-Portuguese Army!!! Inspiring work. I like you new basing. 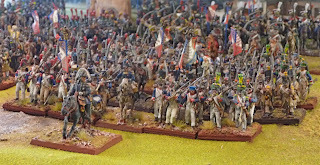 I too use 6 figure bases for my French (40x60mm) but have my french three ranks deep (2 man frontages rather than three). I think your way looks better but three ranks for the french is how my club plays. Impressive! Very nice army, John.